The likelihood of working in a multinational environment continues to increase as globalization extends its reach across numerous industries. Whether working for a small business or large corporation, it’s not uncommon these days in America to be exposed to more than one culture. Diverse international backgrounds and experiences can create a unique, even effective and flourishing workplace if certain steps are taken to ensure cultural differences are understood and respected. Combining a group of individuals of differing cultures and expecting them to immediately perform as a cohesive team does not always work. This is clearly an issue for multinational companies. Generally, people from a particular country tend to share deeply ingrained cultural norms which are distinct from other countries. This combined with language barriers, communication style and organizational differences all affect a company’s performance. Management Style and Structure. Countries approach management from very different angles. For example, U.S. companies may follow consultative or structured individualism while many European countries abide by a more autocratic, hierarchical structure. These differing methods affect how leadership, delegation, negotiation, decision making and attitudes are presented. Punctuality. Monochronic cultures (The U.S., Northern Europe) place high value on being on time and do not value interruptions, while polychromic cultures (Latin America, Middle East) place the focus on socializing and relationship building over the importance of keeping a tight schedule. Workplace Values. 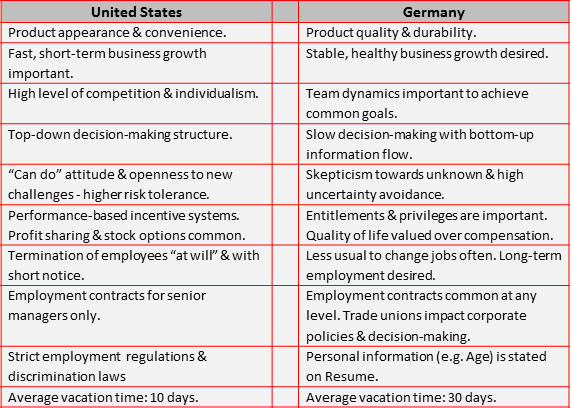 Geert Hofstede, a researcher and published author on workplace culture, has identified six dimensions of national culture that affect employee values. The greater the distance between the preferred value (of a country), the more likely to clash culturally within a workspace. Personal time. Certain countries place high value on observing work-life balance by providing a generous amount of vacation time. For example, every country in the EU has at least four weeks of paid vacation by law. The U.S. is not required to pay even one day of vacation by law. Lunch breaks also vary greatly depending on your country of origin; from working through lunch at your desk to taking a leisurely 2 hour break away from the office. Communication. Verbal and nonverbal etiquette such as body language, shaking hands, addressing people etc. also varies greatly often leading to miscommunication. These differences impact the ability to form strong relationships with coworkers, management and customers/ clients. As you can imagine, merging two such opposing approaches and ideals is bound to present a distinctive set of problems. And again, the above examples only begin to scratch the surface on contrasting worldwide views, beliefs and behaviors. As expected, when you bring people together, there are always going to be challenges to overcome whether it’s conflicting personalities or cultural differences. Despite the apparent pitfalls that arise in a nationally diverse work environment, organizations can benefit significantly from the cultural differences between people. Tapping into a wider range of perspectives and approaches can lead to unique innovation, more creative problem-solving, and unthought-of business solutions all resulting in greater organizational success. Part 2 of this article will take a deeper look into the advantages of a multinational workforce as well as provide insight and tips on overcoming some of the difficulties highlighted in this article.